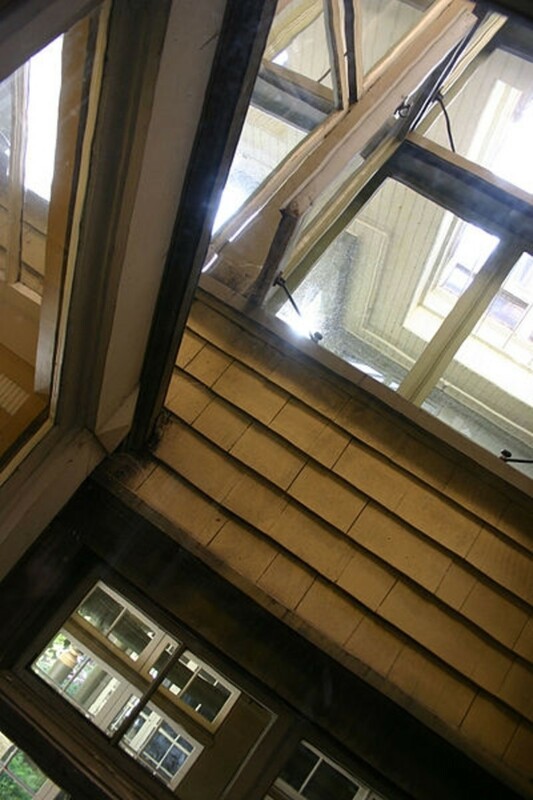 Have you ever been to the Winchester Mystery House? Yes, I have! It was awesome! Yes, I have, but it gave me the creeps. No, but I wouldn't love to see it. Never been there and don't want to. 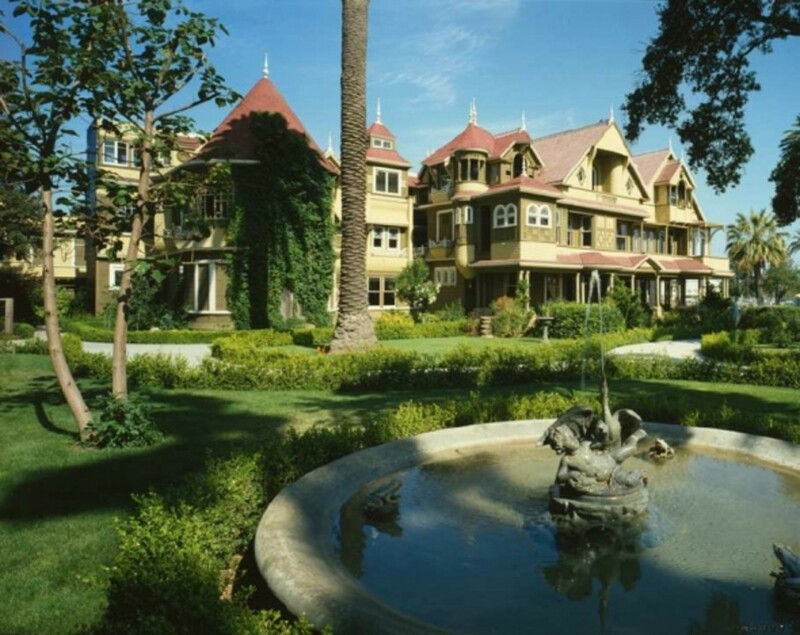 With the movie "Winchester" coming out in 2018, there is renewed interest in Sarah Winchester and the magnificent, eerie house that she built. 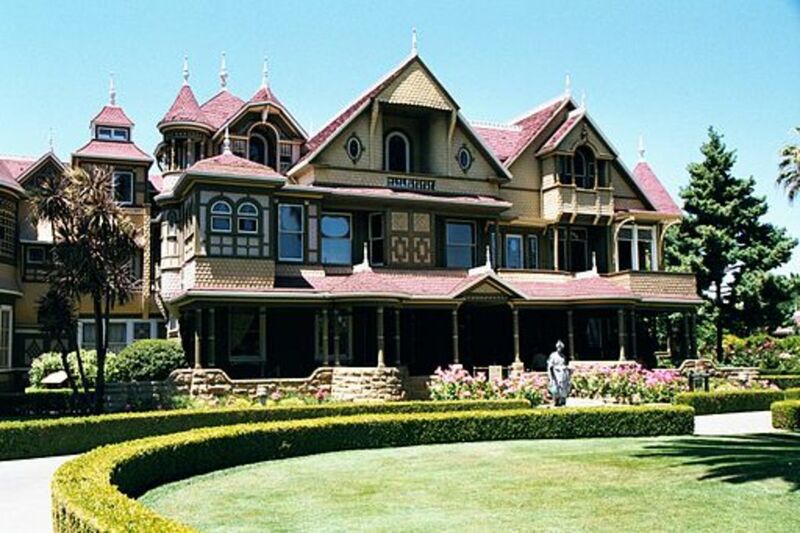 Have you ever heard of the Winchester Mystery House? Sarah was the widow of William Wirt Winchester, back in the 1880s. Her husband's father owned the Winchester Repeating Arms Company. When Sarah's husband died, she became heir to the company. As the legend goes, Sarah was deeply disturbed by the deaths caused by the Winchester repeating rifle. Her husband's father and her husband died within four months of each other. Sarah then inherited half of the company. She became distraught over her losses and soon believe that the family was cursed. Sarah's obsession with appeasing spirits lead to the building of the Winchester Mystery House. Building was constant, 24 hours a day, 7 days a week. Rooms were started and then boarded up. Staircases were constructed that lead to doors that opened to walls. All this was at the bidding of those restless souls who haunted Sarah world. The house was "finished", so to speak, when Sarah Winchester died in 1922. Her house now belongs to all Californians and the world. It is open for tours. And, of course, they have special events for the Halloween season. Many people believe the Winchester Mystery House is haunted. People claim to have seen ghosts roaming the halls long after Sarah died. I visited the Winchester Mystery House a couple of times as a child. We went on one of the tour that took you throughout the house. My impression as a child was that the house was cool and creepy, if not a bit disturbing. I felt a deep sadness for Sarah Winchester. She must have been so burdened with the grief of her losses. The Winchester Mystery house was a Queen Anne Victorian. It was under construction for 38 years--all construction ended the day she died. The cost of construction was approximately $5.5 million. The house has 160 rooms, some boarded up almost immediately after construction. There are hallways that stop at walls. One staircase called the Switchback Staircase, only rises 9 feet with steps only 2 inches high. There are 47 fireplaces in the house. There is even a ballroom built without any nails! 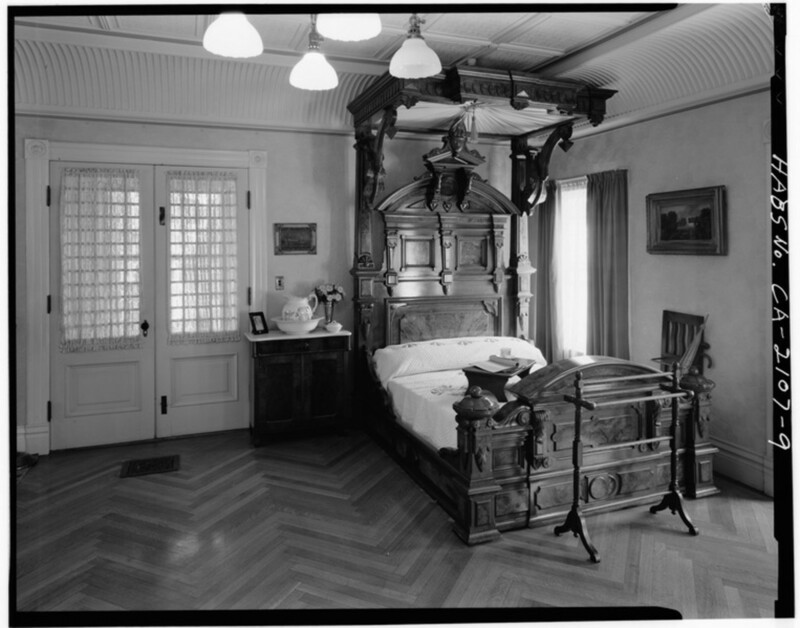 Not only did Sarah Winchester build with abandon, but she furnished her house lavishly. She seemed determined to spend every last cent of her inheritance on the house. 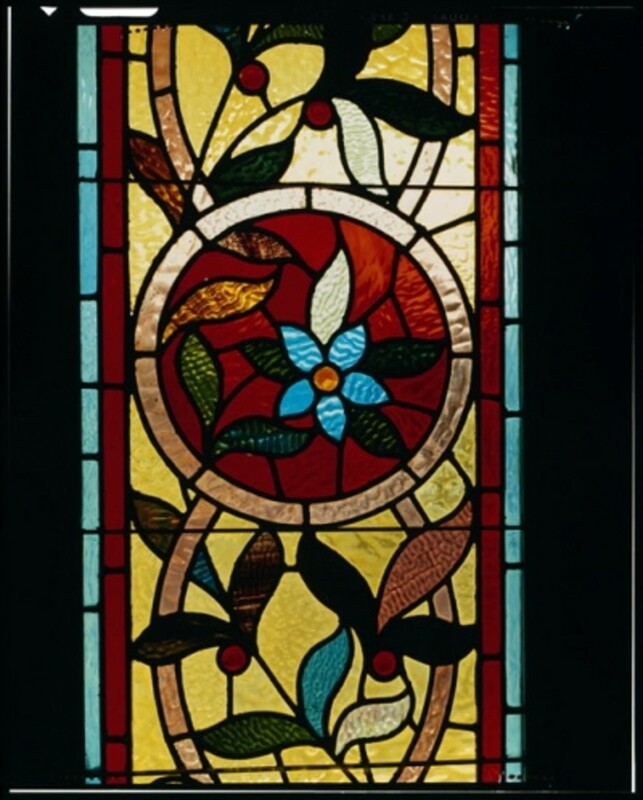 The house is filled with gold, silver, and bronze decorations, parquet floors, windows made of Tiffany art glass, and so forth. When Sarah died there were furnishings stored away that had yet to be shown. 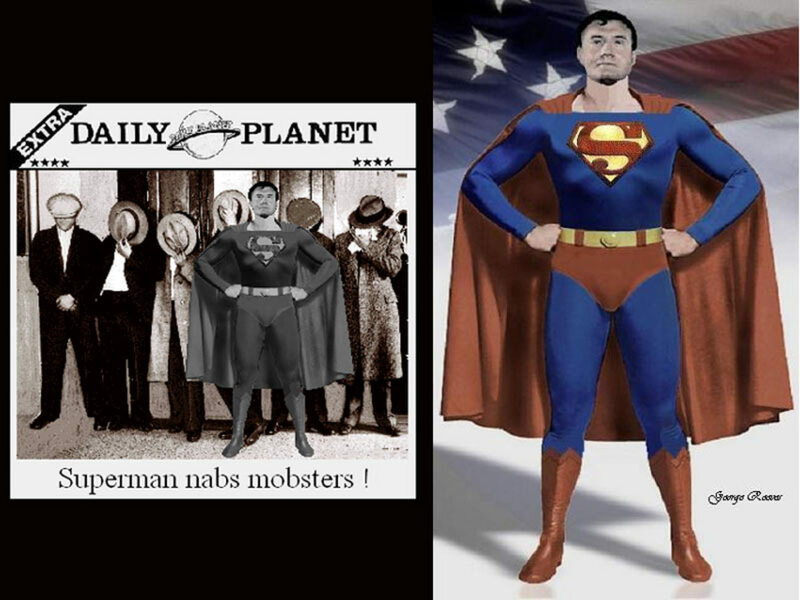 Since I was a child I was fascinated with this story. I wonder today if this eccentric woman would have been treated for mental illness. Would we find her endless construction so harmless today? Sarah's story as told by Mary Jo Ignoffo, a college history professor in California. Explore who she was and why she was so determined to construct this house. It is easy write her off as crazy. She was a woman who had too hardships in a short period of time and she came up with a wild way to cope with it all. Tragedy followed Sarah wherever she went. The Winchestery Mystery house is a manifestation of her sorrow. Sarah Lockwood Pardee was born ca. 1840 in Connecticut to Leonard Pardee and Sarah Burns. Her father owned a carriage manufacturing business and they lived a comfortable life. Sarah had a place in society and was known as the Belle of New Haven. She married William Wirt Winchester in 1862. William was the only son of Oliver Winchester. According to the 1850 U.S. census, Oliver owned a shirt manufacturing company. But, Oliver was working behind the scenes to take over the Volcanic Repeating Rifle Company. He succeeded in 1857. The couple stayed in New England and began a family. In 1866, Sarah gave birth to a daughter. Her daughter, Anne, lived only a couple of weeks. Sarah and William did not have any more children. According to the 1880 U.S. Census, William and Sarah lived with William's parents on Prospect Street in New Haven, Connecticut. William's father very ill, suffering from paralysis. William had taken over the company. Then it seemed everything collapsed. Oliver Winchester died in December of 1880. William followed in March of 1881, dying of tuberculosis. This left Sarah as the heir to the Winchester Repeating Rifle Company. She had 50% ownership of the company and was set for life. She moved to California within a couple of years. She soon began construction on her house. I found Sarah Winchester in the 1910 U.S. Census. She had seven servants including two trained nurses, two cooks, a waiter, a chauffeur, and a gardener. I can only imagine how many other people she employed for construction. She was a one woman job creating machine! She died in 1922. A recluse who left behind a mansion unlike any other. Oliver Winchester bought into the Volcanic Repeating Arms Company in the 1850s. When they became insolvent in 1856, he and his partner bought out the rest of the stockholders. The company was moved to New Haven and renamed the Winchester Repeating Arms Company. After her husband's death, Sarah became deeply disturbed by the deaths wrought by the riles her husband's company produced. And, she links her ill fortune to those deaths. Every night Sarah Winchester went off to her seance room. There she held court with spirits who told her what construction to do next. 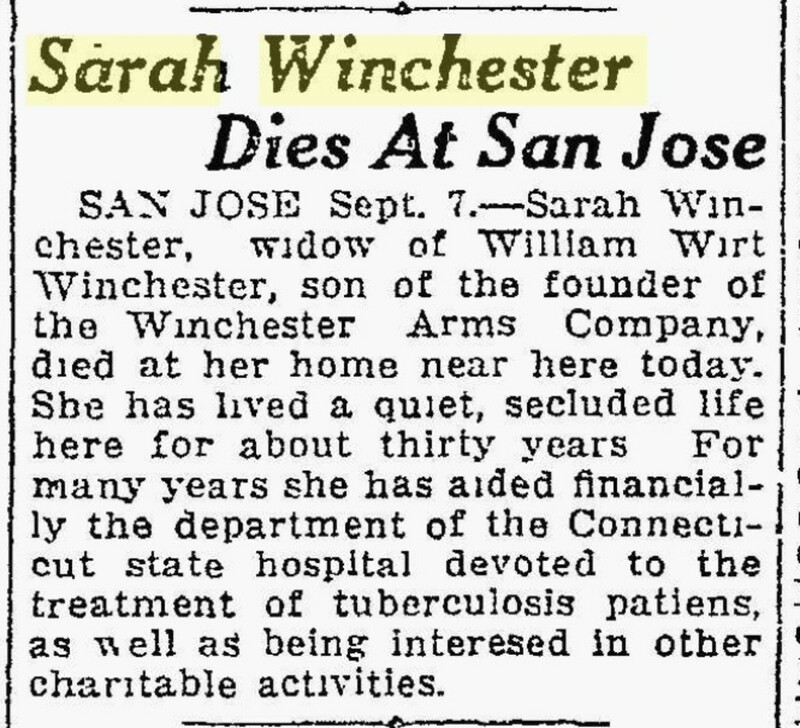 It seems that Sarah Winchester had a pretty good life. She was well educated and well off. She had the usual ups and downs people of her time suffered through. In widowhood, she didn't have to worry about money. The inheritance made sure she would never have financial woes..
Sarah never fully recovered from the loss of her only child. When she inherited half of her husband's family business, she was deeply disturbed. She believed that the Winchester repeating rifle had caused senseless death and pain in the world. The rifles had some reputation. The 1873 Winchester rifle was called "The Gun That Won The West". After the death of Oliver and William, she began to believe that her family was cursed by the spirits of the same people who the rifle had killed. She sought out a Medium in Boston who might help her see the way out. According to lore, the Medium told her that she was haunted "by the spirits of American Indians, Civil War soldiers, and others killed by Winchester rifles." They had taken her daughter, father-in-law, and husband to avenge those deaths. In order to fend off impending doom, Sarah was told to leave Connecticut and build a house. As long as she kept building, she would not suffer. So, Sarah left. She ended up in the Santa Clara Valley in California. And, then she started construction on her house. Construction that went on 24 hours a day for 38 years. It was all paid for from the inheritance from the Winchester Repeating Rifle Company. Did you know that something akin to the Ouija boards were found in China around 1100 A.D.? A similar board was patented in the US in 1891 and marketed in 1901. The Ouija board was popular in the 1920s and 1930s and has tried by many generations. Are you brave enough to give it a go? 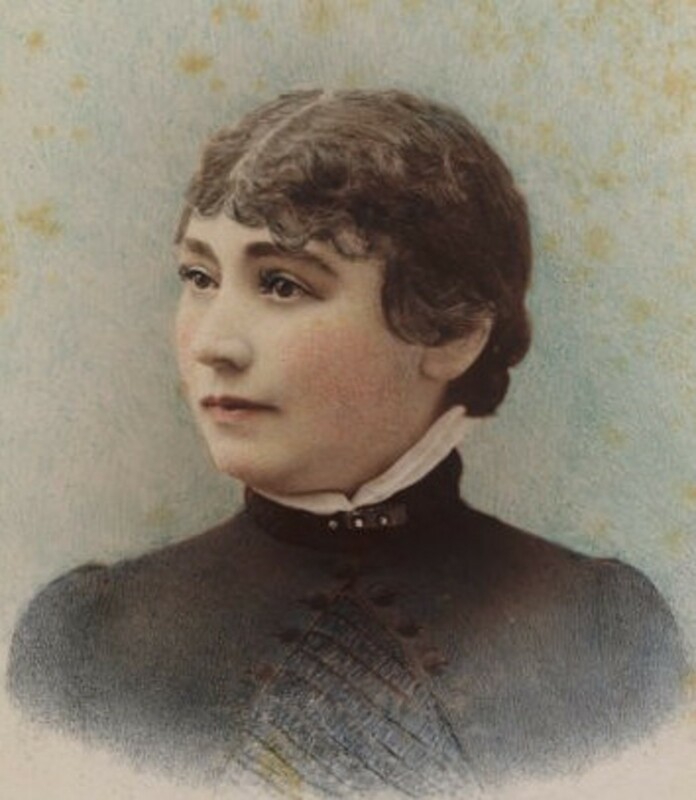 During her time, people painted Sarah Winchester as eccentric, a wacko, and downright insane. There were those who believed she was curse and the the Winchester house was haunted. This obituary from the Oakland Tribune calls her a recluse, but says nothing of her constructive ways. Was it all a myth made up by people who didn't even know Sarah and stretched over time? Was she just a grieving widow filling her time by building an elaborate mansion? Or was Sarah's family really cursed? Sarah left no provisions for the house in her will. When she died, it was auctioned off for $135,000 as it was deemed unlivable. The house was opened to the public 5 months after her death. Would you like to visit the Winchester Mystery House? It's open daily, except on Christmas Day. If you go, take the house tour. They start every 15 minutes and should not be missed! Please check the schedule for dates, hours, and admission prices. If you do one of the Friday the 13th tours you'll be treated to a special bell ringing ceremony. You might have guessed that the owner of this house would be fascinated by the number. At the 13th hour on every Friday the 13th, the special bell ringers, ring the bell...you guessed it...13 times. Adds a bit do the eerie quality, doesn't it? In addition to the regular daily tours, the Winchester Mystery House hold some special events such as flashlight tours on Friday the 13th and Halloween. Tickets must be purchased 2 to 3 months in advance of event date. Winchester starring Helen Mirren as the eccentric widow will be out in theaters in 2018. 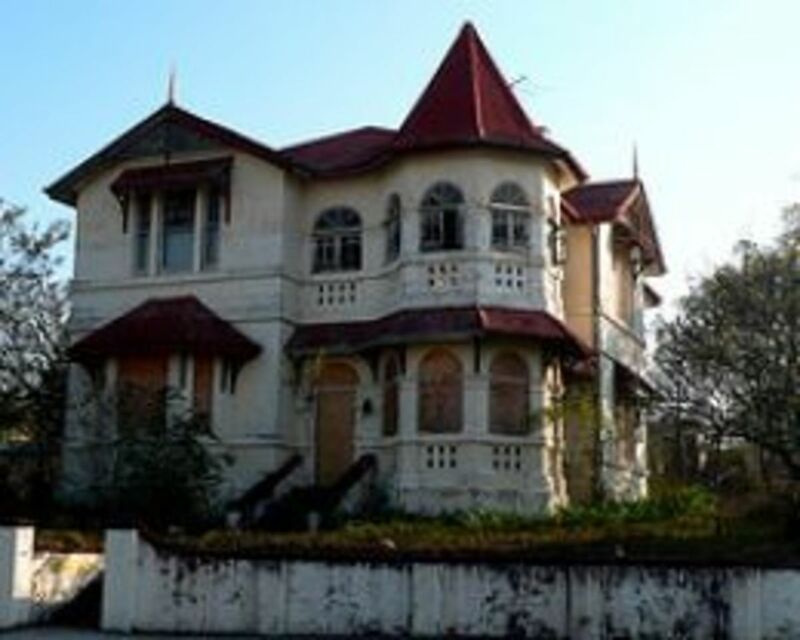 It shows that there is still fascination with Sarah and her house almost 100 years after her death. What do you think of the Winchester Mystery House? Got something similar where you live? Tell us about it in the comments!